Keep your toes toasty with these socks and slipper patterns! 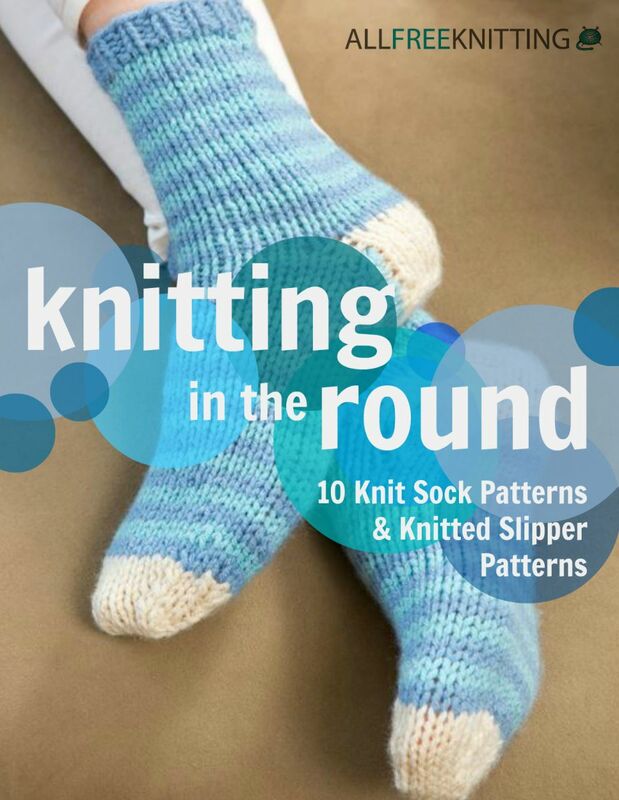 Download your free copy Knitting in the Round: 10 Knit Sock Patterns and Knitted Slipper Patterns today! You are going to love the knitting in the round patterns that we’ve curated for you in this eBook. Make yourself some warm and fuzzy socks that are absolutely perfect for lounging around the house, relaxing and reading your favorite book or watching your favorite movie. The sock and slipper patterns included in this amazing collection are guaranteed to keep you cozy. Make them for your friends and family, and keep them toasty all year round. Knitting in the Round: 10 Knit Sock Patterns and Knitted Slipper Patterns is a perfect eBook for anyone who likes a bit of a challenge and wants to expand his or her knitting prowess. With step-by-step instructions and tutorials, you will learn all about what it means to knit in the round. You’ll be a master knitter of socks and slippers in no time at all when you download this awesome eBook. Baby and Me Socks (pg. 5) - This knit sock pattern is a basic knit sock pattern that is an absolute classic for both adults and children. The simple stockinette stitch base is made cozy by an attractive ribbed edge. Knockoff Baby Uggs (pg. 8) - This adorable knit baby booties pattern is prefect for the fashionista baby who just has to have the latest style. Baby will stay warm while heads turn with these insanely cute knockoffs. Berries and Cream Slipper Socks (pg. 13) - There’s nothing better than putting your feet up after a long day of work. These knitted socks are the perfect accompaniment to a cup of hot tea and a good book. 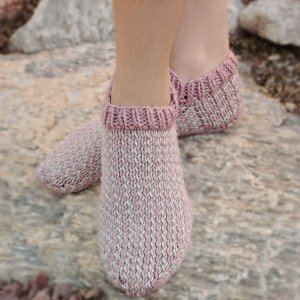 This adorable knit sock pattern is knit with a pretty mix of white and pink. Lazy Day Knit Socks (pg. 19) - No matter what the weather is like outside, the bright colors of these socks will instantly put you in a good mood. Knitting up these socks gives you ultimate control over the fit and shape, meaning that you can create the socks of your dreams. Traditional Fair Isle Slippers (pg. 25) - A good pair of knit slippers can be hard to find, but these are a no brainer. A cute star pattern on the body of the slipper makes these slippers perfect for any member of the family. With our latest eBook, Knitting in the Round: 10 Knit Sock Patterns and Knitted Slipper Patterns, you will learn how to knit in the round. Once you start knitting, you will not be able to stop! Subscribing to our newsletter, Knit Picky Patterns, is a great way to become part of the knitting world. You'll see how incredibly rewarding it is to be a part of the knitting community! Check out this free eBook and the AllFreeKnitting.com site to get tons of knitting inspiration! You can also download this book for FREE at Amazon.com and iTunes! The pattern for Baby and Me socks does not have the number of stitches to cast on, nor a gauge for knitting.